A new batch of limbless orphans is coming! As I mentioned last week, Anna joining the Handmade Hero team means the project is getting a major breadth and fiction upgrade. One of the main aspects we’ve been expanding over the past week has been Lord Crutchlie’s Home for Limbless Children. Originally, the design for the orphanage was quite spare, involving nothing but a room which showed the current unlock state of all the elements in the game. The player started the game here, could look at the unlocks, then hop out the door and into the forest to begin adventuring. But while Anna and I were going over this part of the design, we decided that it was a good place to add artwork in a way that would improve the fictional grounding of the game and give the player more of a sense of home. 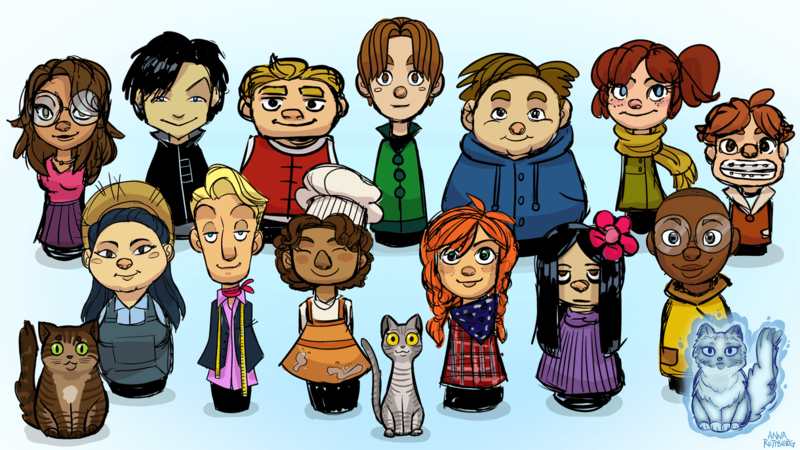 So we expanded the design of the orphanage to include distinct NPCs who share the home with you. You can check out some character concept sketches for these NPCs in the title image. Naturally, all the orphans in the Home for Limbless Children are limbless just like the hero. But each has their own special interests, and their situations will progress as you complete quests in the forest related to them. Of course, since we are cat-obsessed at Molly Rocket, we also decided the orphanage wouldn’t be complete with out all of our cats: Fred, Molly, and the late Hannah Bean, who will appear in fluffy ghost form (she was an extremely long-haired cat!) Although we have worked out design details for orphans, we have to admit we have no idea what the cats do yet, because honestly, we just added them because we wanted cats in the game. We’re sure fellow cat lovers will agree with this “add cats first, worry about design later” approach! Anyhow, that’s all for this week. Until next week, thanks for reading, and we’ll see you on the internet!